In several forums I saw people asking about how we can upload Images or files to server using silverlight. So I thought of writing one to demonstrate how we can achieve it. I become a big fan of caliburn micro and I used it in this app as well. In this demo app I demonstrating both approach of accessing WCF service – Proxy less and Proxy approach. I personally like Proxy less approach so I cannot avoid it here also. Repository: This project contains entities and persistence classes. I made it as simple as possible in this demo, so all the persistence related stuff is in the same project. WCFService.Interfaces: project contains the service contracts. WCFHost: Project host the WCF service. 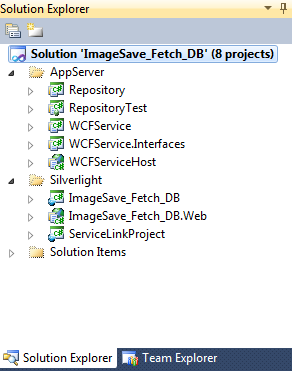 In Silverlight folder I have a Project called ServiceLinkProject, that is a project that has link to entity files. It is used for Proxy less WCF communication. In this demo I used my generic repository mentioned in my previous post. There is nothing much to explain here except the valueconverter I used in the xaml page. I save and retrieve images as byte arrays. But silverlight’s Image control will not be able to render byte arrays. So wrote a Converter inherited from IValueConverter. Let’s see how am using it. 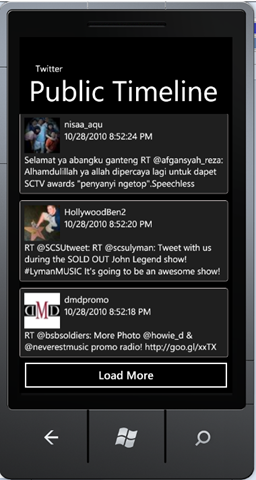 First I created an instance of the converter. Now use this converter while binding the byte to image. I think this project doesn’t requires much explanation. If any one has any questions then am happy to help you out.